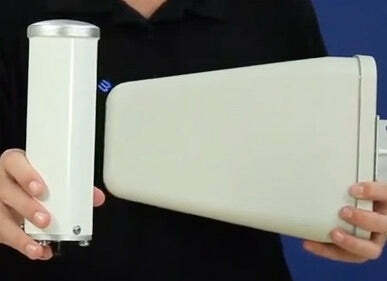 Two types of cell phone signal booster Donor Antennas or Outside/ Exterior/ External Antennas are available: Omni, and Yagi (or Log Periodic, if wide-band). Donor Omni-Directional Omni Antennas attract cellular signals from all directions and from all wireless service carriers such as AT&T, Verizon, Sprint, and T-Mobile whereas Uni-Directional Yagi or Log Periodic Antennas can draw mobile signals from farther away but from only one specific direction of a particular service provider's cell tower. However, what are some of the more specific or exact differences between the two? Knowing the latter will help you to make a better choice when choosing one over another for your cellphone amplifier system. Watch video below detailing these 2 different types of outdoor building roof-top or wall mounted antennas, in an easy to understand format. Transcript: Today, we're going to talk about donor antennas, sometimes called an outside antenna. One of our certified installers is take us through it in the video. The donor is the antenna that is installed outside of a building, and it takes the cell signal from the cell tower and supplies it to the amplifier. The donor also takes the cell signal and sends it back to the cell tower. There are two types of donor antennas. Yagi directional and omni directional. Understanding the differences between these two antennas will help you determine which antenna will be best suited for your installation. I want to throw in a quick note here about directional antennas. Yagi directional antennas transmit and receive a signal in a 100 degree horizontal pattern, and a 65 degree vertical pattern. This is helpful for tuning and detuning the antennas. Yagi antennas provide a gain for 7 to 8dB on the lower frequencies, and 9 to 10dB of gain on the higher frequencies. You will need to aim a directional antenna at the signal source. This is a great feature which allows you to zero in on a cell tower for the strongest connection available when you've got weak signal. Yagi antennas will also receive a signal outside of the beam pattern that we discussed earlier, but without applying any gain. This is a great feature which allows you to detune or point the antenna away from the cell tower if the incoming signal is too strong. A yagi directional antenna is ideal for signals stronger than negative 45dB or weaker than negative 76dB. You can also use a directional antenna to offset the cable loss in long cable runs. An omni directional antenna transmits and receives signal in a 360 degree pattern. There's no aiming of the antenna required since this type of antenna gathers signal from all sides. An omni antenna provides 2 to 3 dB of gain on the lower frequencies and 4-5 dB of gain on the higher frequencies which is ideal for when the outside signal is greater than negative 75dB. A situation may arise where you have a weak signal from multiple carriers but the cell towers are located in opposite directions. In this situation, you will want to install multiple donor antennas on the roof, one aimed at each of the towers. This is fine to do and just requires that you install a splitter. Run a cable from each donor antenna to the splitter and attach it to the side with multiple connections. Then, run a separate cable from the splitter to the booster. There will be some loss for each cable run as well as the splitter, so calculate that into your system when determining how much signal can be used. Keep a minimum of 6 feet between each of the antennas on the roof when installing multiple donor antennas. If you are installing directional antennas, make sure that the signal paths do not cross.